Randolph Stow’s novel To The Islands takes a look at the corrosive impact of colonialism through, aging, bitter missionary, Stephen Heriot, who has spent decades managing a Christian mission for ‘Indigent people’–the indigent people in this instance being Aborigines. When the novel opens, Heriot wakes up in his corrugated iron hut with its grass thatched roof. His books, detritus of his education and a reminder of his long distance past, are literally falling apart. On the shelves of the rough bookcase, Heriot’s learning was mouldering away, in Oxford Books of this and that, and old-fashioned dictionaries, all showing more or less the visitations of insects and mildew. How does a man grow old who has made no investment in the future, without wife or child, without refuge for his heart beyond the work that becomes too much for him? Most of the other white men on the mission, in this “goldfish-bowl of existence,” are looking forward to Heriot leaving, and some think he’s gone “troppo.” In many ways, Heriot is an embarrassment because he represents the old ways of handling the aborigines, and everyone would rather forget the past. While one character defends Heriot, placing him in the context of his times, Father Way says, ” a man who goes round spreading civilization with a stock whip gets no admiration from me.” Heriot has requested a replacement from the regional council, but he receives a letter saying that he must remain as there is as yet no suitable candidate. And this brings in yet another idea–that Heriot, in his youth, had enough fervor, sense of purpose, or belief in his ‘mission,’ and that he was willing to sacrifice his entire life for what he believed in. Yet there’s no one to replace him; no one else has that sense of commitment. What drives people to leave their homes and take jobs in the remote area of Australia under such harsh, unforgiving conditions? Well religion explains some of it but there’s a also an excellent nurse who failed medical school; she’s “perhaps a fanatic of sorts, like a nun,” and a young teacher who “never intended to be involved. But the country had taken him in.” Bottom line these white workers are all driven by something to stay at the mission, but the reasons Heriot came to the mission are now absent. He’s been there too long. He’s ill and he suspects he’s dying. Stow gives us a strong sense of life at the mission –both good and bad (with its pervasive attitudes towards the aborigines as ‘childlike’ or indigent). A crisis erupts with the arrival of Rex, a man Heriot loathes, who’s a subversive influence on some of the younger residents of the mission. This beautifully written novel tackles huge themes of Shakespearean proportions through the story of the bitter aging missionary and his relationship with Rex. The mission has been existence for decades, and while the older residents seem more comfortable with the “indigents’ allowance,” there’s the idea, running under the surface of the story, that this system is inherently unhealthy, unproductive, and corrosive for all involved. With Rex’s unsettling presence, the established order of life at the mission is challenged. Randolph Stow published To the Islands when he was 22 years old. He’d worked for a period at an Anglican-run mission, and in the preface of my copy, he explains some of the changes he made from the original edition. Although the story addresses the cost of colonialism and the inherent wisdom of supporting a native population on an undignified subsistence way of life, this isn’t a story about race as much as it’s a tragic tale of how we battle ourselves and our impulses. The Congo Diary is just a few pages and is basically just a sketchy outline of travel with a few details of the journey. That brought me to Almayer’s Folly for a reread. Almayer’s Folly is Conrad’s first novel, so it’s fitting that it’s included in this anthology. It’s a flawed novel–certainly not perfect, but for Conrad fans, it’s well worth reading if only to fit the novel in the context of Conrad’s later, better work. In its conception, for this reader, the plot is perfect, but the execution is flawed. More of that later. You can’t read books about colonialism without coming to the conclusion that it’s bad for everyone involved. Bernardo Atxaga’s Seven Houses in France, for example, set in the Belgian Congo, shows how the soldiers and officers in the jungle run amok with the natives. While the women are kidnapped, caged and raped, the soldiers have shed whatever humanity they possessed and become bestial. Colonialism says a lot about human nature, exploitation and what we become when removed from our society with its rules of behaviour. Almayer’s Folly, a tale of identity, displacement and greed, goes in a slightly different direction as the novel portrays a blend of cultures and the unfortunate outcome. Almayer, born and raised in Java, is the son of Dutch parents. His father was a “subordinate official” and his mother “from the depths of her long easy-chair bewailed the lost glories of Amsterdam, where she had been brought up, and of her position as the daughter of a cigar dealer there.” As a young man with a good head for arithmetic, Almayer is employed in a trading warehouse in Macassar when he meets Tom Lingard, the so-called “King of the Sea,” a wealthy man whose bold adventures include tangles with pirates and the capture of a young girl found on a pirate vessel. Lingard adopted the girl, the pride of his existence, and shipped her off for a convent education in Java. Startled by the unexpected proposal, Almayer hesitated, and remained silent for a minute. He was gifted with a strong and active imagination, and in that short space of time he saw, as in a flash of dazzling light, great piles of shining guilders, and realized all the possibilities of an opulent existence. Almayer, thinking that “old Lingard would not live for ever,” agrees to marry to Malay girl. in the far future gleamed like a fairy palace the big mansion in Amsterdam, that earthly paradise of his dreams, where, made king amongst men by old Lingard’s money, he would pass the evening of his days in inexpressible splendor. As to the other side of the picture–the companionship for life of a Malay girl, that legacy of a boatful of pirates–there was only within him a confused consciousness of shame that he a white man–Still, a convent education of four years!–and then she may mercifully die. He was always lucky, and money is powerful! Go through it. Why not? He had a vague idea of shutting her up somewhere, anywhere, out of his gorgeous future. Easy enough to dispose of a Malay woman, a slave, after all, to his Eastern mind, convent or no convent, ceremony or no ceremony. This passage shows Almayer’s thought processes as he contemplates the wealth of Lingard weighed against a lifetime with Lingard’s adopted daughter. The dreams of wealth cloud his decision, so we don’t feel too sorry for Almayer when we fast forward and Almayer is very unhappily married to a wife who hates him. The title Almayer’s Folly could refer to Almayer’s decision to base his life on an elusive future fortune, but it also refers quite literally to his dilapidated, unfinished house built on the Pantai River in expectation of the “big trade Almayer was going to develop,” while his father-in-law Lingard goes on a succession of expeditions, an “exploring craze,” to discover gold and diamonds in the interior. Moving to the present, Almayer is a broken man whose hopes of fortune are almost entirely extinguished. He’s terrified of his wife but loves his daughter, Nina. Nina was brought up in a Dutch household in Singapore, but she returns home when her race poses a problem for her caretaker. Circumstances reawaken Almayer’s ambition, but now he focuses on Nina’s future. Her young mind having been unskillfully permitted to glance at better things, and then thrown back again into the hopeless quagmire of barbarism, full of strong and uncontrolled passions, had lost the power to discriminate. It seemed to Nina that there was no change and no difference. Whether they traded in brick godowns or on the muddy river band; whether they made love under the shadows of the great trees or in the shadow of the cathedral on the Singapore promenade; whether they plotted for their own ends under the protection of laws and according to the rules of Christian conduct, or whether they sought gratification of their desires with the savage cunning and the unrestrained fierceness of natures as innocent of culture as their own immense and gloomy forests, Nina saw only the same manifestations of love and hate and of sordid greed chasing the uncertain dollar in all its manifestations and vanishing shapes. To her resolute nature, however after all these years, the savage and uncompromising sincerity of purpose shown by her Malay kinsmen seemed at last preferable to the sleek hypocrisy , to the polite disguise, to the virtuous pretences of such white people as she had had the misfortune to come in contact with. Another problem with the novel is that there are many secondary characters who are mentioned but who never really take shape. Additionally the writing is occasionally sludgy and slow to plough through. The novel offers a portrait of a displaced man with a skewed sense of identity who pins his life on the promise of an elusive fortune; he’s yet another man whose dreams and ambitions cause him to be swallowed up by the jungle. While Almayer’s life is a failure, his daughter, Nina, a product of two vastly different cultures, and rejected by white culture, claims her own destiny. There’s a Chantal Ackerman film version of this. I tried it–couldn’t finish it. Regular readers of this blog know that I’m a W. Somerset Maugham fan, so when I saw a 47 page short story available for the kindle for a mere 99 cents, I couldn’t pass it up. Before the Party, published in 1922, is classic Maugham territory–the relationship between a man and a woman set against the backdrop of colonialism. The Skinners, a middle-aged married couple, are preparing to attend a garden-party, and we know almost immediately that there’s been a death in the family–the Skinners’ “poor” son-in-law Harold has been dead now for 8 months. In attendance at the garden party will be his young widow, Millicent, and her sister, Kathleen. The preparations for the party mostly concern the appropriate clothing and whether or not Millicent intends to appear in mourning. This central theme of appearances–the keeping up of appearances and also the issue of how appearances can be deceiving–are at the heart of this simple little story in which Millicent who’s been “strange since her return from Borneo,” is clearly holding back a great deal of information about the dearly departed Harold and exactly how he died. It was going to be quite a grand affair. They were having ices, strawberry and vanilla, from Boddy the confectioner, but the Heywoods were making the iced coffee at home. Everyone would be there. They had been asked to meet the Bishop of Hong Kong, who was staying with the Canon, an old college friend of his, and he was going to speak on the Chinese missions. Mrs. Skinner, whose daughter had lived in the East for eight years, and whose son-in-law had been Resident of a district in Borneo, was in a flutter of interest. Naturally it meant more to her than to people who had never had anything to do with the Colonies and that sort of thing. The English summer day and well-trimmed lawns are a far cry from the jungles of Borneo, but as time wears on before the party, Millicent brings the darkness of her home life in Borneo into the staid, respectable lives of her family and gets little thanks for it. Before the Party is a clever little story for its plot but also its wisdom. Yes those in support of the Empire can attend their little ‘fact-filled’ parties and nod with enthusiasm and self-righteousness about the missions, but when the dark facts behind the glamour are uncovered, ‘decent’ people would rather not know…. In Maugham’s wonderful novel, The Painted Veil, we see how some a couple of British people, far from their home shores, behave rather badly, and that’s the same idea found in Before the Party. Whereas as in The Painted Veil, a tale of adultery turns into a tale of redemption (with an aside into self-destruction), the plot in Before the Party is primarily about appearances. Of course, if the topic is the behaviour of exiles living on far-flung shores, we must also consider that some people who lived abroad were sent there because they either didn’t fit in with society’s norms and that the various colonial outposts are seen as last-ditch attempts to reform. This topic: exile to the colonies and various corners of the Empire for reform is found in M. E. Braddon’s Henry Dunbar , the story of a dissolute banking heir who’s packed off to India as punishment for engaging in forgery. In the non-fiction book, White Mischief, we see a community of ex-pats, many shunned by society, establishing their own notorious culture in Happy Valley. It’s always fascinating to read about the dominant, ruling races running amok among the natives. Take Bernardo Atxaga’s Seven Houses in France , for example, an excellent novel set in the Belgian Congo. The atrocities against the native population are horrendous, but indulging their bestial natures dehumanizes the officers and the soldiers stationed at the crude outpost. And that’s the thing about colonialism; it’s bad for everyone. 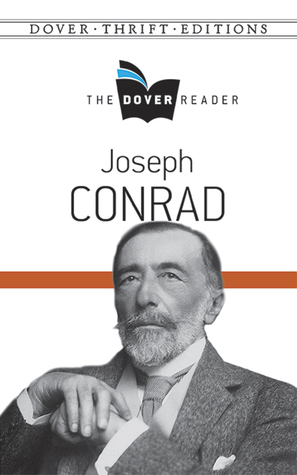 It’s probably no coincidence that after finishing Before the Party, I immediately picked up Joseph Conrad. When I first came across a book from the author Thomas H Cook, I read that he is known for writing cerebral crime novels. That description got my attention, for while I thoroughly enjoy a good crime novel, I prefer my crime reads to be a little off-the-well-beaten track with more time spent on the why rather than the how. 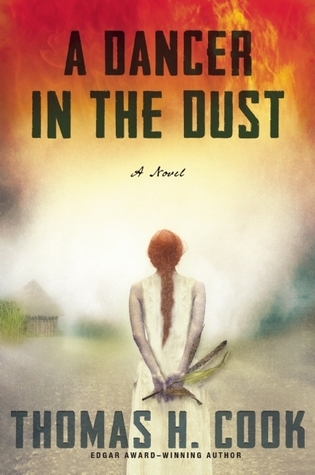 A Dancer in the Dust, my third Cook novel so far, concerns a murder that takes place in New York, and the novel begins with its narrator, Ray Campbell, returning to the African country of Lubanda as part of an unofficial investigation. Decades earlier, Ray, an idealistic Aid worker lived in Lubanda and fell in love with Martine, a female farmer. We don’t know the details of what happened, but we do know, within a few pages, that the western-supported president of Lubanda was deposed in a bloody coup led by the psychotic Abbo Mafumi who called himself “the Lion of God and Emperor of All Peoples.” Ray left his idealistic past far behind wrapped up in his memories of Lubanda, and now he works as a New York based risk management consultant. Ray lives in a “risk aversive world,” but all that changes when he’s contacted by Bill Hammond, a man he knew in Lubanda who now runs a charity trust. He was now at the top of the heap, the Mansfield Trust being a kind of holding company for a large number of charitable institutions and NGOs. At its recommendation, billions in aid might or might not pour into an particular country. With the death of Mafumi, Lubanda is again about to start receiving billions in aid money, but before Bill makes his decision to begin sinking money into Lubanda, there’s a “loose end” that bothers him. He’d been contacted by Seso, a refugee from Lubanda, now an African street vendor in New York. Seso asked for a meeting with Bill, but before that takes place, Seso is tortured and murdered Mafumi style. Bill asks Ray to assess the risk of giving money to the newly established Lubanda government by investigating the death of Seso, who was Ray’s employee in Lubanda twenty years earlier…. So here we have our crime, the murder of a penniless African that takes place in New York. In due course, Ray finds himself on a plane back to Lubanda and all the painful memories he’s shoved aside come flooding back. Everything had gone wrong. The three Cs of devastation: corruption, crime, chaos. Add the rampant spread od AIDS to that mix and the road to hell was fully paved. Of course, it was easy to lay all this at the foot of that fourth demonic C, colonialism. The death of Seso is just the first crime in the book. Other crimes include reference to the atrocities of Belgian colonial rule in the Congo (Martine is of Belgian descent), and of course there’s also the bloody takeover of Lubanda by a psycho dictator who unleashes his frenzied army on the entire population. But at the heart of the novel is the story of yet another crime–Ray’s betrayal of Martine. Martine was born in Lubanda and so she considers herself Lubandan, yet when the political climate in the country shifts, Martine, who is white, is in the crosshairs of both the government that wants to grab her land, and the forces of Mafumi who want to see her destroyed. Ray is told to persuade Martine into accepting the government demand that she abandon growing crops that support the local economy and culture, and instead move to a crop that is supported by western aid.Ray’s best intentions lead to a horrific chain of events, and in a world in which there’s no room for principles, Ray spies on Martine and reports back her activities while Martine stands her ground and takes the ultimate risk. While this is the story of how one man made some really bad decisions, in many ways in his relationship with Martine, Ray is a symbol of western colonialism and exploitation of Africa. He wants Martine and is capable of doing some very underhand sneaky stuff to get his way, all in the name of the ‘best intentions.’ In the final analysis, he doesn’t understand Martine at all, and his desire for her blinds him to everything else. Ray’s self-serving plans backfire and lead to destruction. While he wants ‘what’s best’ for Martine, we can’t forget that this is a white American putting himself into the voting position of deciding what is best for Lubanda & what is ‘best’ for Martine when his stake in the country’s future is non-existent; he’s just a man passing through while Martine’s family has owned the farm for over 50 years. The morally complex plot examines many issues and on a meta level, the novel questions the well-worn model for African aid which breeds a system of unhealthy dependence. A Dancer in the Dust has an elegiac tone laced with regret and memory. The novel questions the risk we take when taking a moral stand, and yet compromise is also not without risk. In spite of the fact that Ray is obviously damaged and never recovered from the decisions he made in Lubanda, he’s hard to like. There’s something a bit slippery about Ray and his actions, and while the novel doesn’t overwork this aspect of the plot, it’s there beneath the surface. 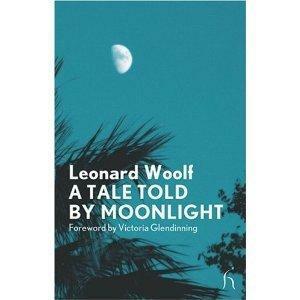 The plot is occasionally heavy on metaphors & similes which weigh the novel down unnecessarily–the slow style conveys the moral heft of Ray’s decisions, and the metaphor/simile embellishments make the narrative voice sound pompous rather than sincere–although this may be the author’s intention. Ray, a morally rubbery man has managed to live with his actions and feels guilty about his choices while somehow skirting the essential core of desiring Martine so much, he was willing to destroy her. 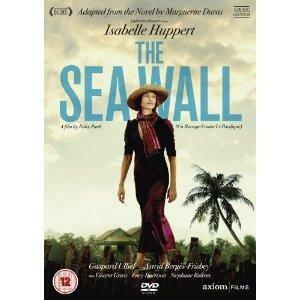 I recently watched the stunning film The Sea Wall (Un Barrage Contre Pacifique) starring Isabelle Huppert, and when I discovered that the film was based on a book, I decided to read it. 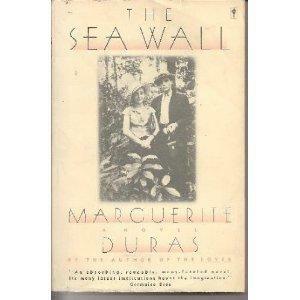 The Sea Wall is a semi-autobiographical novel written by Marguerite Duras. Years ago, I’d seen The Lover, based on yet another Duras novel, and although the film was a big hit, I wasn’t a fan, and I was certain I wouldn’t like her novels. But even with that prejudice in mind, I didn’t hesitate to buy the book version of The Sea Wall. I was hoping that the novel would add some of the details missing in the film. I was not disappointed. The daughter of peasants, she had been so bright at school that her parents had allowed her to go to college. After that, she had been a schoolteacher for two years in a village in northern France. That was in 1899. Occasionally, on Sunday, she stopped to gaze at the Colonial propaganda posters in front of the town hall. “Enlist in the Colonial Army!” said some. And others: “Young People, a Fortune awaits you in the Colonies.” The picture usually showed a Colonial couple, dressed in white, sitting in rocking-chairs under banana trees while smiling natives busied themselves around them. She married a schoolmaster who was as sick of life in the northern village and as victimized as she was by the maunderings of Pierre Loti and his romantic descriptions of exotic lands. The consequence was that, shortly after their marriage, they made out a joint application to be sent, as teachers, to that great Colony then known as French Indo-China. Basically they were sold a bill of goods. When the book begins, Suzanne & Joseph’s father is long dead and Ma, who remained in Indochina, has managed to support the children alone. First she earned a living giving French and piano lessons, and then for 10 years she played piano in a tiny “moving picture” theatre. Scraping up savings, she then applied “to the cadastral government of the Colony for a concession of land.” Ma, Joseph and Suzanne have lived on this piece of land for 6 years when the book begins, and life there is a disaster. The first year Ma puts half of the land under cultivation, but she bought land on a flood plain, so the land is flooded and the crop ruined. She tries the same the next year with the same results. The government agents who sold her the land were well aware that the land would flood, and of course there’s a little catch here. All the land must be under cultivation or it will be seized by government agents. The concessions were never accorded except conditionally. If, after a designated period, the totality had not been put under cultivation, the Land Survey department would seize it. None of the concessions on the plain had been accorded a definite title; these were the concessions which easily enabled the land agents to make a considerable profit on the others, the real and arable concessions. The choice of attribution was left to them. The agents of the Land Survey reserved the right to distribute, according to their own best interests, immense reserves of irreclaimable land which, regularly attributed and no less regularly taken back, constituted in a way their reserve of capital. On the fifteen land concessions of the plain of Kam, they had settled, ruined, driven off, resettled and again ruined and driven off perhaps a hundred families. The only claim-holders who had remained on the plain lived by traffic in opium or absinthe, having to buy off the cadastral agents by paying them a quota of their regular earnings– “illegal earnings,” according to the agents. When Ma complains that the land is worthless and that the agents knowingly sold land that she could not cultivate, the agents threaten to seize the land before the deadline for total cultivation is reached. This is, of course, the ultimate threat. Ma scrimped and saved to buy the land dreaming that she was creating a legacy for her children, but in reality, she’s only tied them to a place which holds no future for them. Both Joseph and Suzanne can’t wait to leave. Joseph has sidelines as a guide and as a smuggler, but Suzanne, however, has few options other than marriage to a stray hunter. There’s the sense of the uselessness of their continued existence. Joseph spends his nights hunting and slaughtering animals that the family find too repulsive to eat. Ma, Joseph and Suzanne spend their days “soaked in boredom and bitterness,” as they engage in an endless and futile battle against the elements and also against the impervious corruption of colonialism. Not a great deal happens in The Sea Wall, and through this lack of action, the author creates a sense of ennui; Joseph and Suzanne are waiting for liberation, but that liberation will only arrive through the establishment of external relationships or through the death of their mother. Ma’s failing health seems to reflect the slow decay in which the family live. The large, but primitive house built on the property is mortgaged to the bank and the roof is rotting (as are Joseph’s neglected teeth). While the family seem to wait for something to happen there’s an underlying tension beneath all the inertia, depression and slow drift of day-to-day survival. Something big does happen when Mister Jo, the son of a millionaire planter takes a fancy to Suzanne. Mister Jo becomes sexually obsessed with Suzanne, and she practices using her new-found sexual power, getting presents for her efforts. Suzanne’s relationship with Mister Jo is encouraged by Ma who in her turn becomes obsessed with the idea that Mister Jo’s wealth will solve all their problems. The Sea Wall gives another view of colonialism, and the focus isn’t on the exploitation of the natives but the exploitation of those foolish and idealistic enough to cast themselves out into one far-flung outpost of empire. Ma and her children are cannibalized by the corrupt system, and consequently Ma is alienated from the country of her birth. She never talks of returning, and instead she hates colonial officials, identifies with the exploited natives, and encourages rebellion. This unforgettable novel includes many poignant details of local conditions–the massive die-off of local children and packs of starving dogs who trail after children in order to eat their excrement. This bleak, unshakeable image epitomizes the horrendous situation in Indochina and the pecking order of need. While The Sea Wall explores the corrosiveness of colonialism, on another level the story also explores parenthood and how the sacrifices parents make for their children are sometimes only an unwanted, heavy burden. One of the reasons I started blogging was with the idea in mind that I’d pick up some great recommendations along the way, and that happened recently when John Self over at the Asylum recommended a book I’d never heard of, Hugo Wilcken’s Colony. I just finished the novel and I’ve one word to say SUPERB! Colony is set in 1928 and begins just before a shipload of convicts arrives at the French penal colony of Saint-Laurent. Saint-Laurent is the port in French Guiana at which “selection” takes place and convicts are sorted and shifted to other locations. The bulk of the story is told through the eyes of Sabir, a 30-year-old WWI veteran, and in spite of the fact he’s survived the trenches, he’s quite aware that surviving in a penal colony is another matter entirely. Sabir keeps a nervous eye on fellow inmate Bonifacio, a Corsican jewel thief who holds a position of unassailable power on the ship. Apart from his threatening physical presence, since Bonifacio escaped from a penal colony and made it back to France, he knows what awaits the convicts and knows the basic geography of the area, and this makes Bonifacio a valuable, yet difficult, source of information. Sabir is an excellent observer and a quick learner, and he rapidly and falsely manages to gain a coveted job as a gardener. He’s sent to Camp Renee where he becomes the convict pet of the deranged camp commandant. If you tend to have a fondness for Joseph Conrad (like me) then just a very basic plot outline of Colony should have you dashing out of the door for the nearest bookshop. Trust me, you won’t be disappointed in this intense novel and its examination of colonialism, freedom, and identity. One of the fascinating aspects of Colony is that the book takes a slightly different view of the old colonial paradigm. Whereas most fiction books on the subject of colonialism focus on a) the mistreatment of the native/subjugated population and/or b) the corrosive taint of colonialism on the dominant culture, Colony fascinates by its focus on how exactly a dominant world power, France in this case, spews out the debris of empire on the distant shores of French Guiana. In Colony, while the white men are still on the top of the heap, the book focuses on how other men who are outcasts of French society fit into the schema. Some of the convicts (Sabir and Edouard) are WWI veterans, but that fact certainly doesn’t ameliorate their sentences.The natives remain noticeably (and sensibly) in the background while the French masters exploit their fellow citizens–underlings for the most part who’ve fallen foul of the French legal system for a range of reasons. It’s interesting to note that preceding chapter one there’s an appropriate quote from Dante’s Inferno: “I did not die–yet nothing of life remained.” Oddly enough, in my desire to begin the novel I didn’t see this quote until later, and yet the Inferno came strongly to mind for the first few chapters of the novel, but the quote that I recalled was “Abandon Hope All Ye Who Enter Here.” When Sabir arrives, it would seem that he’s arrived in hell–hell on earth, that is, and the only escape is death. Just as Dante describes the various levels of hell, Sabir discovers that life on a penal colony is also composed of variations of hell: arrival is just the bridge to the next level–the best level of hell is acquiring a job as a house servant for an official, and the worst level of hell–the level to be avoided at all costs–is life at the forest camps where disease, hunger and drudgery await. Here again I thought of another quote–but this time the quote wasn’t from Dante: it was from Nazi death camps, such as Dachau & Auschwitz : “Work Shall Set You Free.” (Arbeit Macht Frei). It’s a particularly sadistic, twisted and sickly ironic turn of phrase, isn’t it? One of the greatest scenes in Conrad’s Heart of Darkness describes the futility of a French man-of-war “firing into a continent.” This sort of lunacy exists in Colony mainly through the Commandant’s futile efforts to recreate a French country mansion–complete with an Orchid garden–in the middle of the jungle, using convict labour. The Commandant’s strange form of jungle megalomania assumes the shape of incredibly detailed plans for the future, and the Commandant plays with scale models while he drinks himself into oblivion. While on one level Colony is a marvellous story that takes place within a French penal colony, on another level the parallels within the rich text allow the reader to make subtle connections and in the process engage in a meditation on the subjects of freedom and identity. The convicts who are all “judicial objects[s]” arrive stripped of any personal possessions, and all that remains are their names and sometimes their crimes, but even the crimes they committed form a type of identity. Thrown out in the jungle in a dehumanizing system where the strong, the crafty and the savage survive, identities morph and become as useless as other trappings from society. But is it necessarily negative to devote one’s life to obscure projects, obsessing on the trivial until the trivial becomes the essential? Is it a ‘bad’ thing to perfect one’s existence as the orchid grower does and find some sort of happiness and sense of purpose in such an endless task? Wilcken seems to be saying that a sense of purpose, even an obsessive sense of purpose, can be a wonderful thing. The orchid grower continually cultivates and expands his garden while in contrast, everything the commandant undertakes fails. At one point in the novel, he imports dozens of boxes of orchids from France, but they rot en route, and the commandant moves onto another phase of his plan for the jungle, abandoning the notion of an orchid garden in spite of the fact that the jungle is laden with indigenous orchid plants. Whereas the Chiswick orchid grower is content with his solo project, the Commandant requires others to make his fantasy complete, and perhaps therein is the problem–after all, Sabir makes his greatest errors when he decides the fate of others. The hierarchy of the penal system breeds violence, corruption and exploitation, and those in power inevitably abuse their position with direct cruelty or neglectful disinterest. The inherent unhealthiness of hierarchal systems pervades the novel–in the memories of WWI, in the treatment of the prisoners and by the vicious conflicts within the convict population. In the case of some of the convicts, poverty brings a variation of enslavement on the inevitable road to crime. In many ways, Sabir’s situation is far better in Camp Renee than his former life in France. Is he more or less “free” in the penal colony? Was Sabir better or worse off as a soldier in the trenches of WWI? What does being ‘free’ really mean? In spite of Sabir’s privileged position with the Commandant, the idea that “freedom” exists outside of the borders of the penal colony gnaws away at Sabir until he becomes obsessed with escape and “inaction is no sort of option.” The notion of escape into the jungle is an insane venture, but in the treacherous echo chamber of ideas, the convicts begin to imagine that escape is possible. As the novel develops it becomes clear that we are all prisoners of our circumstances and confined by our characters and desires. Simenon’s novel Tropic Moon examines colonialism and how it corrupts those who wield the power–in this case the French residents in West Africa. Simenon presents a world of “ethical blankness” centered around a small town ironically named Libreville. A young, naive Frenchman, Joseph Timor begins to feel a vague disquiet when he arrives in the sweltering African heat. He’s supposed to take up a position stuck in the middle of the jungle at a merchandising outpost. When he arrives, Timor learns that the man he is supposed to replace has gone bonkers and is threatening to shot his replacement if one shows up. If this isn’t bad enough, the boat necessary to take him to the outpost is broken, so in the meantime, Timor heads to the town’s only hotel–the Central–until the boat is fixed. Socially and culturally, Timor is unprepared for the Central Hotel and its inhabitants. It’s the local hangout for all the bachelors, and Timor soon discovers why when he meets the hotel owner’s notorious wife, Adele. Both Adele and her husband were white slavers in France who were sent in exile. While Timor is at first shocked to see how the French abuse the native population, a combination of constant whisky and Adele’s occasional nocturnal visit to his room soon conquer any scruples he once had. Unfortunately, Timor is too innocent to realize that Adele’s way of welcoming Frenchmen to West Africa is just another means of adding them to her coterie of followers. As Timor’s code of ethics is washed away by the whisky he imbibes and by the knickerless Adele, he gradually becomes immured by the morals of the colonialists. He becomes disinhibited, and events that would have shocked him just days earlier soon seem perfectly normal and acceptable. When the murder of a young black man occurs, Timor sinks further and further into a moral quagmire until it’s almost too late. Written in a minimalist style, Simenon doesn’t focus on the psychology of his characters–rather the emphasis is on the gradual desensitization of Timor to colonialism. Timor begins by noting with horror the social and cultural behaviours of the unleashed French, but a few bottles of whisky later, he’s joining in. Things he would have refused to do when he arrived, he grabs with gusto as his morality erodes. Simenon maintains a distance from his characters by not exploring their motivations, and this serves to illustrate that colonialism becomes almost an instinctive reaction for those who embrace its corrupting tentacles. Emma Larkin–a pseudonym for an American journalist–makes an extraordinary journey in the book Finding George Orwell in Burma. Fascinated by the idea that Orwell was irreversibly shaped by his youthful experiences as a policeman in the far-flung reaches of the British Empire, Larkin traces Orwell’s steps in Burma–a beautiful–yet troubled country. Orwell lived in Burma in the 1920s, and according to Larkin, he was perfect fodder for the Empire. He was the product of a “long line of colonial families” with Orwell’s father “overseeing the production of government opium crops” in India. Orwell specifically requested a posting to Burma. This was considered a rather odd request as Burma was certainly not a popular choice, but Orwell had several generations of relatives who lived in Lower Burma. Larkin initially visits the police training station in Mandalay where Orwell lived as a probationary officer, and from here she strikes out into the countryside. The narrative weaves together glimpses of Orwell’s early life, and quotes from his novels with Larkin’s encounters with many of the locals. Apparently, the Burmese hold a special affection for Orwell–even though both Animal Farm and 1984 are banned. This is a remarkable book, loaded with exquisite descriptions of the lush exotic landscape, and it makes fascinating reading for Orwell fans. Not only does Larkin trace a rather obscure period in Orwell’s life, but she also reveals the realities of present-day Burma–now renamed Myanmar. It’s a country, she argues, which a tourist could visit, enjoy a pleasant idyllic holiday, and go home without any idea that the Burmese people suffer under totalitarian oppression. This oppression, Larkin argues, is largely “hidden from view” but the country has a vast network of spies, “donated” labour, “forbidden areas” and incredible censorship. As a tourist who gets off the beaten track in the effort to retrace Orwell’s steps, Larkin encounters invasive government suppression and fear repeatedly on her journey. The Burmese people she meets are remarkably stoic in the face of totalitarianism, and as the author details exactly how the present brutal regime attempts to control how its people think, chilling comparisons are drawn to 1984.